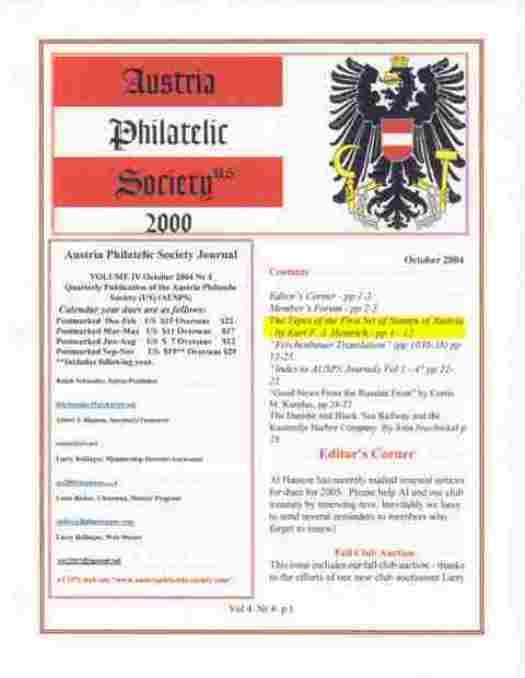 The Austria Philatelic Society publishes a journal quarterly. A typical journal contains a Members Forum where questions and concerns from members are discussed by the membership on an on-going basis. The main features are however, stories and articles written by the members, which are lavishly illustrated. Most of these articles contain information not readily available in such an easy to read and understandable format. There is also an on-going translation of the well known Dr. Ulrich Ferchenbaur work, Oesterreich 1850-1918 Handbuch und Spezialkatalog (Wein 2000), and currently (Wein 2008). An index of the translations is available. In addition to Austria, many articles covering related nations' issues also appear periodically such as Bosnia/Herzegovina, Czechoslovakia, Italy, and their related areas, etc. Also as a service to our present and new members, back issues can be obtained from the Publisher/Editor. Please write to Ralph Schneider, PO Box 23049, Belleville, IL 62223 at a cost of $5.50 each. More information at back issues. This page represents a sample from one of the Austria Philatelic Society Journals. For the complete sample article (highlighted area) from this journal, click on this sample page link.